Mayfield Beach for camping, fishing and swimming. Mayfield Bay Conservation and Camping Area. The Mayfield Bay Conservation and camping area is adjacent to Mayfield beach on the Tasman Highway 20 kms south of Swansea on Tasmania’s east coast. The campsite has toilet facilities and good camping sites with a beautiful beach for swimming and fishing. The beach has splendid views of the Freycinet Peninsula over Oyster Bay. This is a ‘bring your own campsite’ with no fresh water available. Camping is free with a small donation requested for help with upkeep. Just a short stroll to the south of the campsite is a hidden gem in the Three Arch Bridge which the new highway has been built over the top of. 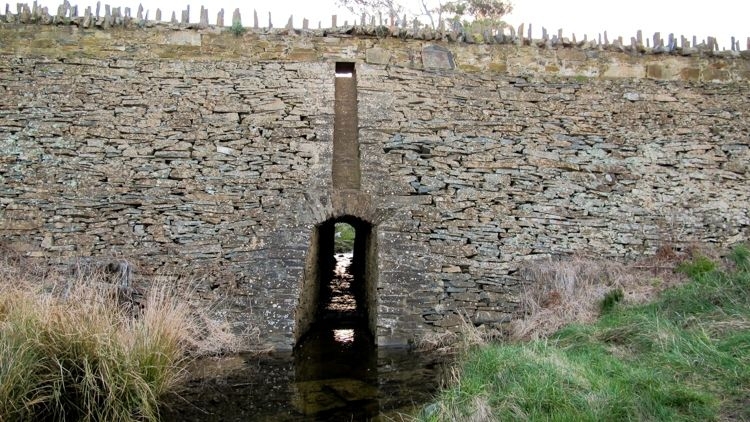 This convict bridge, built in 1845, hidden from the highway above shows the workmanship of the convict labourers which is seen in so many bridges and buildings throughout Tasmania. Another bridge of note is the Spiky Bridge to the north of the campsite which is visible from the highway and has a parking area adjacent. History of Mayfield and the Three Arch Bridge (sourced from the information sign at the campsite). The original people who lived in this area were called the Luntitamareleheenaa. They cared for the total environment because they lived by a strict set of principles (laws) that strengthened their relationship with every aspect of their environment. By compliance with their laws the people were able to enjoy what the sea and the land provided in terms of foods, spiritual guidance and harmony. 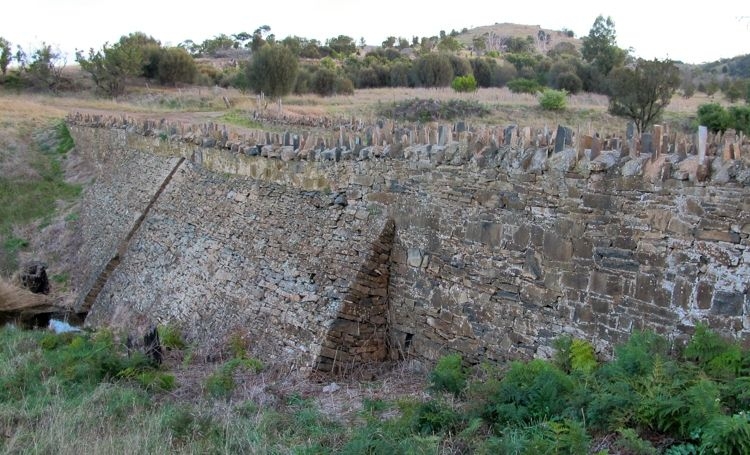 From 1841 to 1848 the Rocky Hills Probation station operated just 2 km north of Mayfield. 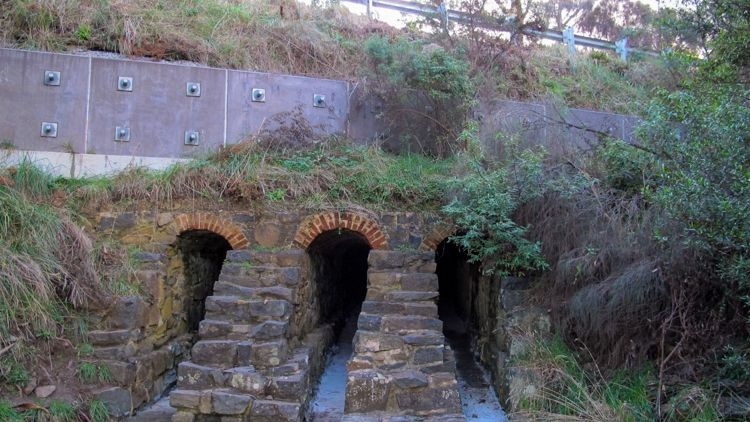 The male convicts housed at Rocky Hills formed government work gangs for local projects. The Rocky Hills convicts worked on the Old Coach (or Convict) Road and numerous local bridges such as the Three Arch Bridge (on Old Man’s Creek, just south of the camping area) and Tirzah and Spiky Bridges (north). The Old Coach Road passed right by this site, an overgrown section of which can still be located at the northern end of camping area. During the probation station period a vegetable garden was established up Old Man’s Creek. Mayfield was also the site of a brick making works. The red bricks were used to construct the station buildings and for road and bridge construction. Occasional red brick remains are found around the campsite. For a long time after, Mayfield Beach was known as Brickmaker’s Beach. From the early 1820s Mayfield was privately owned by several families, the last of which was the Dunbabins of the ‘Mayfield’ property – they sold to the Government in 1978 who proclaimed it a Coastal Reserve and camping area. 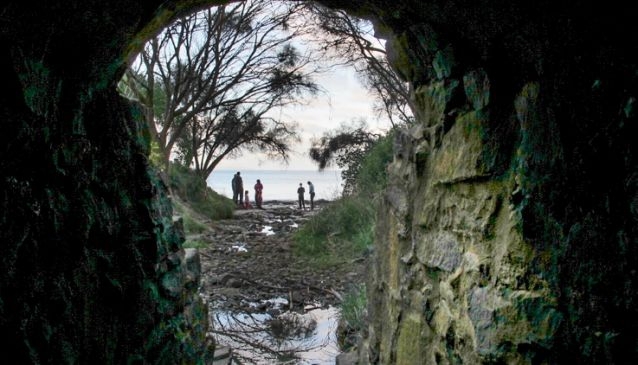 Today the Mayfield Bay Conservation Area encompasses an area of 26.4 hectares, approximately 5 km of coastline from Mayfield Jetty (south) to Freemans Beach (north) and includes this popular campsite. Family groups have been enjoying this beautiful site regularly for their summer holidays for up to 50 years. Three generations in some families have made this place their preferred holiday destination. A collective of 90 families and individuals now make up the ‘Friends of Mayfield’ some of whom each year assist in working bees to care for and improve the camping area and surrounds.